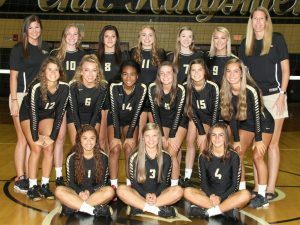 Coach Sarah Hendricks earned her 200th career victory as the Penn Kingsmen Volleyball Team traveled to New Prairie and defeated the host Cougars, 25-15, 23-25, 25-14 and 25-15, on Thursday, Sept. 27. Alyssa Torres hammered 16 kills. Italia Fields and Rachel Rupert had 13 kills each. Ally Hickey 9 kills. Naomi Williams had a tremendous 45 assist in the Kingsmen win. Kylee Hixenbaugh had 21 digs. Naomi Williams had 19 digs, Rachel Hickey 18 digs, Julia Beers 16 digs.